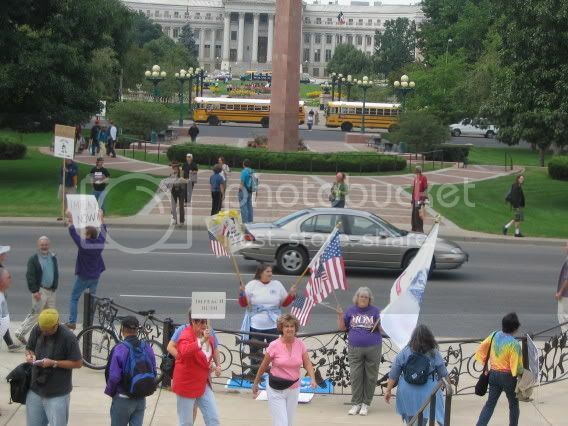 Yesterday three of us attended the Denver Anti-War rally at the Capitol. I had invited a friend who is the mother of a soldier to come with me to counter protest the demonstration. Even though my friend Ruth is a busy Grandma she decided to take some time out of her day yesterday to attend the Freep. Jan in Colorado had contacted me privately and we decided to meet at my home and drive down together. The three of us had a wonderful conversation both on the way down to the rally and the way home. As we shared stories of activism, passionate political views, and our backgrounds as mothers it was obvious we had much in common as women. I had a feeling that we would be the only ones to counter this demo, and I was right. Right after we arrived at the capital it started. A young woman called out..."we support the troops"... a tad defensively in my opinion. Ruth called back..."no you don't". We just walked on. Then we made our way to the front of the building where the moonbats were in full flower on the steps of the capital. Jan wanted to take some pictures so she went right into the crowd and started snapping. She heard someone say, "she is from the other side". With red, white, and blue clothing, a big cheery smile, a patriotic eagle pinned to her shirt, and the clear eyed freeper persona....a conservative infiltrator?? ya think? Meanwhile Ruth and I set up camp down in front of the building on the sidewalk in pretty much the same place I had stood at the March rally. I pulled out my desecrated UN flag and stood on it and we immediately drew attention from some of the anti war people. First was a man who immediately warmed to us, asked if he could help us at all, take a picture etc.. He was so friendly, then all of a sudden, he had this horrified look on his face, and he said "you are standing on the UN flag???" I replied, "yes, I am stomping on it"
He was so upset I thought he was going to burst into tears. He spent the next five minutes telling me how awful it was that I was stomping on the UN flag. I let him talk and then I asked him if he felt comfortable with people who burned the US flag. "do you support their right to burn the flag???" I asked. "yes I do" he replied, but then he went on to express that he felt the UN flag was sacred, and he just could not understand why ANYONE would want to stomp on it. I just told him that I felt similar feelings when I saw someone desecrate the US flag, and hoped that he could understand my need to stomp on a symbol of something I considered evil. He eventually stopped the argument, and then expressed to me that he respected my right to free speech, and walked away. I saw him on the steps just up from me, and he kept talking to people and pointing at me, and shaking his head. I felt for the guy. Symbols mean things, and our progressive friends know which symbols they pledge allegience to. After this, Jan came down to join Ruth and I and we commenced our Freep. We just stood and talked to people who engaged us in conversations, and then the media people noticed us. A man from UPI took a picture, and we were interviewed by three news cameras. It looks like Channel seven in Denver is not going to post the story they taped. We watched the five PM news..no mention, and my husband watched the 10 PM news and they mentioned the DC and Denver anti-war demos, but did not even bother to mention the counter protests. Perhaps they thought only three women demonstrating did not warrent a story??? We also had quite a few photographers stop by and take pictures of us, I don't know if they were reporters or people from the rally, but we just smiled and tried to be friendly. The most fun part of the day came at the end when three clean cut young men approached us and asked if they could interview us. These students were journalism majors from CU in Boulder, and they were putting together a piece for their student run show "On the Inside". I put the microphone on and the interview began. The interviewer asked me some good questions about why we were at the rally, who we were, and how Free Republic worked. He also asked questions about the draft, and when I pulled out my UN flag Hankie and blew my nose on it, he wanted to know why I hated the UN. Ruth made some comments about the draft, and the cameraman said "we should get her on tape too, that was a good comment" So they put the mic on, and interviewed her about a potential draft, which she said no way, no how was going to happen. After this we headed home and had a wonderful chat about the days events and shared some more background info and memories from our growing up years and family life. All in all it was a couple hours well spent, and really fun to do. Jan took a ton of pictures and will add them to this thread. If I was a democrat I would not want people like this representing my party, my views, or my platform. They were an embarassing display of moonbat cluelessness. It was fun to make a new freeper friend, stand for truth, and share stories, lives, and a couple hours in the beautiful denver fall sunshine. Thanks to you all for your support from a grunt in Iraq. Way to go gang!!!! Thanks for representing the rest of us Colorado FReepers. Stomping on the UN Flag really gets the leftists going. I used to put cigarettes out on mine. LOL! I lost it down a storm drain during a thunderstorm. Thank you so much for representing all of us so proudly. The democrats love their demonstrators, the uglier more hateful the rhetoric the better. flag of the UN was a reflection of that of the USSR.At parades I sometimes wear a desecrated? UN Observer badge. secure /accepting such might be the case.Anyhow Thanks. Thanks, Jenny. I wish I was in your area. I would certainly join you. We had a good time! Did any of you see the Denver Posts version of this story??? NO MENTION OF COUNTER DEMONSTRATORS! Jenny PS I did notice those monks walking up, they walked right by us, and seemed quite interested in our little display. Thank you so much. 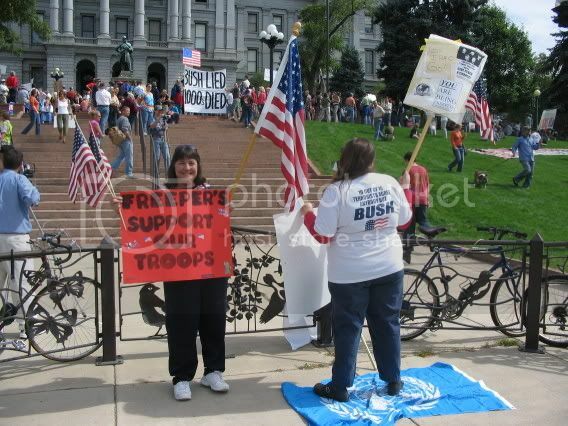 When I get home from Iraq I will be going to these rally's as often as I can. I am so sick of the media playing this out like what we are doing is awful. If you support me, shut the hell up and let us complete it (directed torwards the media and brainless liberal scum). Please know I would gladly lay down my life for anyone in my great country because I know that with all we have, million of others were buried before me so I could enjoy it. I just wish the liberals would realize this, and it honestly is quite bothersome to read the news/editorials every day. Such garbage from people who complain about everything yet sit back and enjoy the freedoms that other people have died for. Thank you so much for your support and God Bless. When I get home from Iraq I will be going to these rally's as often as I can. We had a counter Cindy Sheehadi protest here in St. Louis. Near the end, a young fellow came running up. He was with the Missouri National Guard, recently back from Iraq, and he was worried that no one would be there on the side of the troops, but there we were with our flags and signs. The whole thing would have been worth it for that alone. Thanks so much for all that you do and know with certainty that there are many more of US than THEM, despite the media's best efforts. 300,000 trained Iraqis. Countless schools and hospitals. Consitution. Elections. Who's losing? World wide socialism and communism are losing! Who is winning? Freedom lovers everywhere! Who are the "activist" Progressives??? I believe they are largely a group of individuals who have aborted away children, lived in alternative lifestyles that don't produce children, or they have limited the number of children born to them out of environmental concerns. It is easy for these types of people to take off on a bus for washington to be a part of the "largest anti-war demonstration since the war began". Those of us who have large families have a difficult time dropping everything to go counter, or even to plan something big. I know my free time is so precious as a busy mother of five. But I had you and soldiers like you (my brother served in Iraq last year) on my mind the whole time I was demonstrating yesterday. Don't lose hope, don't let the biased coverage make you feel sad. And please just remember that in all wars, especially after a summer of "all Cindy all the time" and tons of negative war coverage, does take its toll on the populace. Time is going to be very kind to your mission. As Iraq rises from the dust and stands strong as a bastion of democracy and freedom in that ravaged part of the world, you will be able to tell your grandchildren the stories of how it happened. Take heart! Don't be shaken by those whose agendas are as dark as their hearts! Be confident, calm, and just trust that in the end the truth will set all of the nations free! Freeper Activist and mother of FIVE future Patriots! BUMP FOR A PATRIOT ACTION! Thanks. You are a true patriot. Beautifully done. Cheers to you ladies! I know it takes courage to go up against leftist low lifes. I love the story about the UN flag. I held an Israeli flag at a pw/freep counter protest and was physically threatened. Didn't faze me, and I held it higher, with my American flag. At this same event, the anti-war protestors started their rally by dragging the American flag through a muddy puddle to the cheers of the rabble. I commend you all for your stand! I pinged everyone who posted on this thread, in case you wanted to see some pictures. I hope you don't mind! Thanks for your report, Jenny! I am so thankful to have gotten to FReep with you! You are the epitome of a proud American, who calmly speaks the Truth. You aren't intimidated by anyone, and you give awesome interviews on camera. My guess is, they didn't put the interviews on-air, because you weren't angry and hateful. Several times the media would try to get us to say we were protesting "them" BEING there! We always replied, "They have EVERY right to be there. This is a FREE Country, and we can have different opinions. The problem is, THEY want to silence anyone that doesn't agree with them"! FReeper Jenny Hatch and military mom Ruth as we begin our FReep. Jan in Colorado and Jenny in position at the bottom of the Capitol. The message on Jenny's shirt wasn't appreciated by the crowd. I had many people ask me "What is a FReeper"? We had a lot of fun answering that one! The crowd continues to arrive as Jenny proudly waves the American flag and Ruth waves the Army flag. (I am now on my way carrying nothing but a camera, into the crowd to take pictures of this rally for "peace and justice." More to come...you won't want to miss it! CHEERS TO YOU!! Jan, you look great! Wish I could have come out this weekend, I wanted to go to DC, but still recovering from another bout in the hospital..but nothing can keep me off FR for too long, lol! Will freep mail more to you , but just wanted to say how proud I am of you and Jenny and Ruth! Thanks for your Freep. We are always behind you 100% and more.